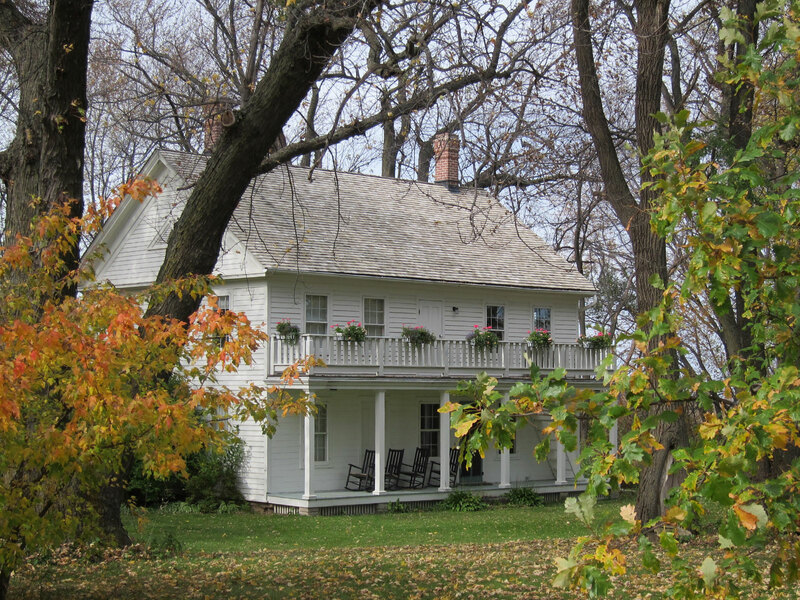 Perhaps the most interesting story to emerge from the efforts to restore the Veblen farmhouse in Minnesota was the discovery that the Joseph Dorfman biography Thorstein Veblen and His America, long considered the definitive account of Veblen's life and scholarship, was very unreliable. The man who was paying for the restoration had promised, in writing, to the Minnesota Historical Society that he intended to use Dorfman's biography as the definitive word when it came to restoration decisions. But it soon became apparent that the spectacular house that Veblen's father had built on the edge of USA civilization with hand tools did not enhance the narrative that Dorfman was trying to sell. He wanted to Thorstein Veblen to have grown up in a log cabin among barely literate immigrants only to be rescued by the westward advance of Congregational educational institutes like Carleton College. So this monument of ingenuity became a log cabin in his telling. Needless to say, calling this primo pioneer dwelling a log cabin did not provide much information on how to proceed with the repairs. Fortunately, Dorfman had sent out advance copies to some Veblen family members probably hoping for some sort of endorsement. Older brother Andrew was incensed at the portrayal of the Veblen's economic and social circumstances and wrote several pointed letters trying to get the account changed. Dorfman did NOT want to change his narrative because so much of his bio revolved around the idea that Veblen had miraculously emerged from an impoverished and primitive childhood. 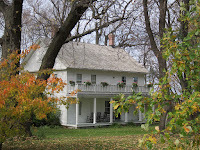 After several increasingly exasperated letters where Andrew described in detail the Minnesota farmhouse, he finally sent Dorfman pictures of the house and barn. Not surprisingly, when those letters and pictures were found in the Columbia library, they proved to be VERY helpful in making the restoration as authentic as possible. But what of the Dorfman biography? The restoration seriously discredited it yet because it hangs around in university collections like so much toxic waste, serious scholars continue to be misled by it to this day. Dorfman was a full professor at Columbia so we have a situation where someone in a position of trust has seriously poisoned the debate about early 20th-century political thought�mostly because he couldn't be bothered to get the story straight. Personally, I find the real story about Veblen's childhood development at least 100 times more interesting and informative than Dorfman's fairy tale. Dorfman built a comfortable career out of being the go-to expert on Veblen�that he couldn't be bothered to get it right is very troubling to me. It is clear that fake news has consequences. The kind being retailed for premium prices in academe is especially harmful. It is utterly impossible to make progress or solve problems unless one has a crystal-clear understanding of what's happening. If you have been misled by an Ivy academic, you are really in trouble. You spent a great deal of money and effort to get bogus information so questioning it is especially difficult. Then you must unlearn that bad information in order to replace it with better information. It can take years just to get back to square zero. Below John McMurtry has written a stunning indictment of fake news and its consequences. He actually believes the problem has become so serious it could even topple the USA empire. Think of it as the consequences of Dorfman's BS multiplied by, oh, a million. US ruling ideology and Washington power have become unstuck as never before. A war of opposing certitudes and denunciations is waged day to day between the long-ruling US corporate media and the White House. Both continuously proclaim ringing recriminations of the other�s �fake news�. Over months they both portray each other as malevolent liars. US bully pulpits are now beyond show disagreements and successful media inquisitions of the past. Slanderous accusations long confined to vilifying the designated Enemy have crept into accusations of the President himself. �The Russians are coming� is returning as the final recourse of smear to stop deviations from the global program of hugely profitable enemy hate and perpetual preparations for foreign war. Beneath the civil war of official narratives, cognitive space opens for truth long suffocated by �the Washington Consensus�. Even the US-led G-20 has recently agreed not to automatically condemn �protectionism� as an economic evil. The battle slogan of transnational corporate rule over 30 years has been quietly withdrawn on the global stage. Is the big lie of �free trade� finally coming to ground? It has long led the hollowing out of societies and life support systems across the world in a false mass promotion as �freedom and prosperity for all�. In fact beneath the pervasive fake news, a closed-door transnational corporate command system forces all enterprises across borders into a carbon-multiplying trade regime with thousands of rules to protect the transnational corporate looting and ruin of home economies and environments as the only rights enforced. Propagandist names and fake freedoms are proclaimed everywhere to conceal the reality. The corporate-investor regime has stripped out almost all evolved protections of workers, ecologies and social infrastructures. Non-stop liquidations and roboticizations of local jobs and enterprises are reversed in meaning to �jobs, jobs, jobs� and �higher living standards�, the very opposite of the facts. Destabilization and bombing wars attack resource-rich and air-defenceless societies outside the circle of treaty subjugation. False news allows every step. Even the happy-face Trudeau regime is taken aback by the tidal shift to national priorities. Its ministers scuttle around the US in near panic to find common cause for restoring the unaccountable regime. Multiplying carbon, disemployment and ecological plunder are ignored throughout in the longest standing fake news of all ��economic growth�. �More prosperity for nations and the world� means, decoded, more transnational corporate-state treaties to deprive nations of their rights to organization and production for citizens� real needs as well as organically regulated protection of environments and ecosystems. As for the Obama solution, �we need more Canadas�, fake news again conceals the reality. Beneath the global celebrity hype covering empty and broken promises, Canada�s Trudeau regime is essentially a brand change of PM rhetoric to advance transnational corporate dictates as �free trade� and to ensure oil pipelines out of the most polluting oil basin in the world, Alberta�s tar-sands, are built through water basins and indigenous lands across Canada and the US. One cannot help but observe this is Trump�s plan too, and overrides Trudeau�s promises to protect Canada�s first peoples. I recently sent a letter to my local MP requesting evidence for what PM Trudeau promises over months of repetition that �more free trade� means �a better life for those in the middle class and those wanting to join the middle class�. As always, there is no evidence to support the non-stop false news from the PMO. Revealingly, the �middle class� turns out to be people making $180,000 a year slated to get significant tax cuts. Trump�s rogue elephant charge on Washington-led lies, war, and dispossession of the working class is no solution to life-blind corporate globalization. Trump in office is a US nationalist oligarch commanding policies even more blindly rapacious in despoliation of the environment and transferring far more public wealth to the rich. The common ground of all our lives, collective life capital, does not exist for any government in �the free world� or any policy of �globalization�. The lies that must be promulgated to advance the private corporate agenda are built into its transnational command system from the beginning. Joining the dots shows that every step of US money-party �globalization� has, in fact, been driven by fake news. No corporate media tolerance has been given in a quarter of a century to any voice demanding accountability to the common life-ground of citizens. A new game of numbers has proceeded instead. At most, a euphemistic �climate change� has been endlessly debated while the totalizing destabilization of human and planetary life cycles remains without a name or collective response. Only more profitable market panaceas which do not reduce any pollution continue to divert from the deepest degenerate trends destroying the planetary life host. On the upside, the big lies of �free trade� and �humanitarian wars� have been called into official question for the first time by the Trump presidential campaign, and he has been elected against the official line. Yet opposing camps are still at each other�s throats. So the perpetual fallback on accusing the long-designated foreign enemy is triggered by the fallen establishment. The fake news chorus of Russia�s aggressions now includes collusion of the Trump administration with its officials to win the US election. This mainspring diversion from reality is called back from the dead witch-hunts of the past. As then tool, facts do not count, only accusations do. The official media line is almost predictable: Russia is behind Trump�s election victory. As always, reverse projection is the mass-psyche operation to blame an official Enemy to divert attention from the life-and-death facts. The Enemy is once again accused of doing what the US has always done worse as the reason for attacking It. Russia is the usual placeholder in this reverse-blame operation. The 2016 US election of Trump is the latest variation. This time the accusation is �interference and attack on the US presidential election� with no evidence of wrongdoing or vote manipulation whatsoever. Yet as in the long past, the method is smear with no evidence for the accusations. Ever more media repetition and shadowy insinuation does the job. It has always worked before, why not again since all the other media buttons pushed on taking down the Trump peace initiatives with Russia and opposition to globalization of US jobs have failed. Having wondered during the election campaign whether we could be �friends with Russia� and promoted diplomatic relations into his administration, Trump can be named as the enemy in hiding to be rooted out. The real problem the fake news never mentions is that he threatens the cornerstone of the US war state over 70 years. So the rest follows. All the non-corporate and non-profit messages from the critical sites on the internet commons which are speaking against the US war state inside are now vilified as �fake news�. A third, unofficial protagonist has entered the battle with no private profit or career motive or corporate boss to serve and a wealth of proven professional knowledge and talent at work. It has to be denounced to sustain the big lies of the ruling money-war game which is in deepening crises and conflicts all the way to the unprecedented US President-Press civil war. The innermost fount of US ideology and war, Harvard University, has now stepped in. It is officially naming and denouncing US-critical internet sites for �fake news�. In the background, Harvard University has long propagated an unexamined academic method. It normally cuts off any faculty or learned source of opposition to the private corporate rule of America and the wars of aggression to impose it on the world. Accordingly, the underling grand narrative equations of the US is Good and the designated Enemy is Evil is not questioned. It is presupposed. Malevolent motives are always assumed of the designated Enemy, down to Harvard-produced geostrategic economic and war models. So when a host of internet commons sites challenge the grand narrative framework, Harvard and satellites denounce them to stop people reading them. A long list of critical sites is accused without criteria, proof or evidence as all spreaders of �fake news�. Here there is no commercial-profit condition to speak and write, and no livelihood dependence on private profit. There is no inducement to avoid life-and-death issues in academic obfuscation or ad-vehicle style. Internet authors not on the payroll can be free of the game of all games behind the scenes � enriching the rich further with no life-coherent criterion of truth. When challenged in this way, Harvard (and the official press) are set back on their heels. They cannot think the facts through because their instituted presumptions have long been what they must presuppose and not question to acquire their credentials and pay for public speech. They must attack what calls all this into question if it effectively speaks truth to power to expose or de-legitimate the ruling system narrative as false. Harvard and the US press thus follow the reigning method of reverse projection. They accuse the effective opposition of �fake news�. The most revealing fact here is that Harvard authority as other academic administrations proceed in name-calling without any valid argument or demonstration � the very basis of reasonable conclusion. Yet this is such a long tradition of presumptive accusation allowed against anyone designated as the Enemy, and anyone else exposing the falsehood of the ruling US story of moral superiority over all others and God�s blessing to lead the world by force or money. This is why only dissenting sites from the official storyline of US freedom and rightness in all things are accused as �fake news�. Accusation of opposing positions is so well-worn into conditioned brains that endless repetition locks it in as self-evident. This is why attributions of vile motive are automatic from Harvard or the New York Times for any outside leader opposing US interference in their countries including elections. US hypocrisy here is staggering, but unreported. In fact, Harvard�s life-blind elite of war criminal geo-strategists, economic modellers and so on are fawned upon within the wider corporate rule they serve. Despite Google black-holing of radical legal facts, CIA penetration of Wikipedia, and so on, the internet commons� freedom of speech is far beyond anything guaranteed in the US constitution. In fact, the �sacred US Constitution� that all presidents give oath to �preserve, protect and defend� guarantees in the end only freedom of public speech to private money demand. Long before the Supreme Court�s 2010 decision reverse-titled as �Citizens United�, the US constitution was structured to one overriding end � to remove prior limits to private-money right over all else, including to begin, the rule of British law and the lands of the first nations West of the Appalachians. This is why no common life interest exists in the US Constitution from the start. People�s universal human life necessities of water, food, protection and liveable environment are ruled out a-priori. This is why civil rights themselves were first federally enforced by the �commerce clause� protecting freedom of commercial bus passengers including blacks to cross borders. Even the iconic rights of �life, liberty and happiness� turn out to be in fact only private market rights which allow corporate �fictive persons� to unlimited money wealth, protection against public redistribution, and the freedom of private wealth alone to speak to America by buying corporate self promotions and election attack ads. We may recall that the corporate-press and Wall-Street-enriched candidate for the presidency, Hillary Clinton, started the accusation of �fake news� to explain her defeat. As establishment mask of the politically correct masses with the money-war party as her paymaster, Clinton blamed her fall in the 2016 US election on the new enemy she saw arising against the official story and herself. When the �glass mirror� story line did not take, she joined forces with the corporate media on another plane. �Fake news� misled Americans. The New York Times, the Washington Post, the TV Networks, and other establishment tale tellers saw pay-dirt far beyond Clinton�s failed bid for president. In fact, the corporate mass media were losing marketability by the escalating appeal of free social media. The once all-powerful press propaganda system has been increasingly deserted. The �fake news� story provided a media base to condemn free internet news and commentary as immoral. The 2016 election became the leverage for a big market grab back. Very soon it was not just �fake news� to spike news cycles and subscriptions. War as peace and corporate globalization as freedom found its long place of rule � the enemy of Russia to blame. Now the news can be that Russia hacked and attacked the lost 2016 election. Russia may be a hollowed-out shell by global corporate and oligarch dispossession. But it can still continue as pretext for US-NATO war crimes and aggression reverse-blamed on it. As the European breadbasket and newly discovered fossil-fuel rich nation, Ukraine is a very big prize. Now in Ukraine�s US-led coup aftermath and ethnic civil war, evil Russia can be an ace card again to accuse for attacking the US election. Since Russia led by Putin is drawing the line as in Crimea to support the Russia-speaking region against US-led war crimes under international law (documented in previous articles), all roads connect. �Russia�s uncontrolled aggression� is reverse-projected onto the victim again in a glorious new use. Reverse blame it for interference in the US election of Trump and kill Russia-US peace initiatives at the same time. No fact is required to verify the accusation, and no law broken is needed to insinuate treason of whoever relates with Russia�s officials in peace initiative. It can work even against an elected US president. At the same time, the US�s own record attacking other nations� elections and societies is thereby erased as well � continually orchestrating mass-murder and dictatorship to sabotage the electoral process from Vietnam and Chile to Ukraine in 2010 and Latin America social democracies since. It is interesting to observe two precedents. Past inquisitions were unfolded soon after Bill Clinton said in India, �it�s time to level up rather than down in global trade� and Richard Nixon founded the Environmental Protections Agency, stopped corporations from outsourcing US jobs, and made peace with China as Trump sought with Russia. The ludicrous hypocrisy, factual vacuum, and war-drums of blame-the-enemy go into high-volume operation again, led by an attack-dog media against the elected US president whose only action has been to have business-like relations with Russia. Few observe the immense stakes of the US media and war establishments in this process. Cui bono? � who benefits? � is the question never asked. What�s new? The perpetual red herring of �Russia aggression� takes everyone�s eyes off the ball � including the continuing US-drone mass murder and ecological wars built into the Trump agenda. Canada�s oil and mining corps and big banks sneak behind the pervasive fake news with a smiling Trudeau front. NATO demands more money behind Trump now fulsomely praising what he earlier campaigned on as �obsolete�, as he has done with the CIA he also condemned. Those hoping for a new departure under Trump from the big lies and war crimes as normalized operations watch in a combination of horror and hilarity. Who connects the dots? Beneath official notice, the ruling goal of US empire is blind to its consequences of human and planetary life ruin. It has to cover itself in false news to carry on. This is why fake news is not a temporary phenomenon of the Trump era. It is the necessary veil of illusion of an eco-genocidal system. The symptoms and trends are everywhere. But a US-led prism of false inversions of reality regulates consciousness, perception and reaction to �steer the course�. This is true of both sides of the Trump divide, and also in corporate Canada as the US�s largest trading partner, branch-plant and resource cornucopia. What is new is that the ruling illusions are divided against themselves at the top of the US political and ideological system. The Trump phenomenon reflects the rupture. The US empire is in deep crisis from its cumulative destruction of social and natural life support systems. Its carcinomic multiplication of private money demand with no tie to the production of means of life is the reality beneath all the false news. Nothing is life secure. The �global security system� protects only money values and sequences through life hosts. Peoples everywhere compete to make it go faster to survive. The ruling concept of �economy �inverts the systematic depletion, degradation and despoliation of the life capital of organic, social and ecological life. Universal necessities of human and fellow life are stripped, polluted and wasted as �efficiencies�. The pattern is clear but unspoken. The Enemy Russia is the auto-pilot of fake news to divert from US and client leadership failure on almost every level. Relations of mutual respect with Russia�s ambassador are �collusion� and taboo. How does disclosure of Hillary�s Clinton�s apparatus theft of the Democratic nomination from Bernie Sanders get blamed on Russia? The question is not asked. The Washington mass media and visible Congress focus instead on accused �collusion with Russia� with very big stakes in the new inquisition show. Suspicions without substance run free in the mass media once the designated Enemy is smeared onto the target, even if elected president. Who knows that the US joined the armed forces of Britain, colonial Canada and Japan to crush the 1917 Russian Revolution on behalf of the Czarist autocracy and Western capitalism? More deeply, who names the governing objective behind all the shows of force and accusation over a century since? To be managed successfully, attention must be diverted from the facts of US-led war crimes and public looting within and without US empire proclaimed as �world freedom�. The dots again are not joined. The completely counter-productive war against Russia to keep the US money-war state going is deepened by Wall Street. The falling price of oil is driven beneath notice by Wall Street which has successfully short-future-traded oil down to establish its money-printing powers by debt as supreme over its rival substitute, while diverting everybody�s attention from the greatest fraud in history still going. Observe that Wall Street remains untouched even from its multi-trillion dollar heist from public and pension coffers from 2007 on. Blame Russia is the normal chorus which Wall Street benefits from as the ultimate leader of the ruinously anti-productive money-war system. It pays off so well to the money party in more public dollars appropriated by its control and issue of money debt for everything that exists; the pervasive military-industrial complex which never gets reversed even in the peace after the planned destruction of the �Evil Empire�; and the corporate mass media in front turning the fake news system over continuously to promote, idealize and divert from the global empire�s war and occupation powers. The neo-con and neo-liberal war strategists alike are built into the dark state as managers uniquely dependent on Russia as the Enemy. So it is in all their self-maximizing interests to sustain perpetual accusations of some enemy�s evil as the great cover-up story of US empire and it inherited war-crime system. Joined to despotic local oligarchies, this axis dismantles ever more societies for corporate, bank and military plunder and jackal payoffs everywhere (including the academy). There is no limit or borders to the established system invasion, and all is at the expense of public treasuries and of life support systems across domains. President Trump does not break the fatal ruling cycle. He demands that vassal states should pay for their US military protection, a new global extortion supporting new NATO oligarchies against change which accompanies his stripping of environmental protections to pay for more war powers. Trump behind his populist bluster is a paradigm example of instituted US capitalist greed and aggression. Yet the fact that hate of the Enemy is smeared even onto him for not hating Russia too reveals the ultimate pretext of the US-NATO war machine. Behind the US-led perpetual arms build-up, border threats and bombings of mostly innocents across the globe while blaming the terrorists for the horrors now built into the global �growth� system is fake news as continuous cover story. The war-criminal drone mass murders continue on unnoticed. The bank looting of public wealth is instituted more broadly. The universities, health systems and public infrastructures are privatized for profit with no life criteria of outcomes. Trump is dispossessing the American common wealth for big US money in line with the Reagan public-looting machine before him. It drained public revenues into a black hole of US debt, blamed acid rain on trees, and portrayed orchestrated mass murderers of socialists in Afghanistan and Nicaragua as �freedom fighters�. What has changed in the corporate media�s fake-news today? Trump in office is the opposite of the anti-establishment candidate he promised to be. He wars on the US Environmental Protection Agency (its only collective life protective organization). He fractions corporate taxes in a giveway to the rich beyond Reagan�s $500-billion tax cut. He privatizes the public�s falling infrastructure for speculators and developers� long-term private tolls, profits and control for private profit at taxpayers� expense. Trump does not hide the privatization for profit of America�s public infrastructure and stripping of public health and environmental protection policies once he has rising stockholder support in office. The Trudeau Liberal party masqueraded as the social democrat NDP in promising whopping public investment to win the election, but when in office lets the giant privatization boondoggle trickle out in sunny avoidance of the facts. The monumental schemes of robbing the commonwealth at every level are led by slanted and selective reports through every step across ever more domains. But a constant across US empire is Russia the Enemy to justify it all. In the deepening life support crises of this ruling axis, Russia�s projected �attacks� still lead the show. With no common ground but belief in God�s blessing over all nations and the greatest killing machine in history to enforce it, US ideology may seem to be a psychopathic rationalization writ large. In consequence, the �global free market� the US leads and imposes has no feedback loops to protect human or planetary life against hollowing them out for transient commodities, private profit and wastes on every level. The ruling system is structured only to ensure more money demand and commodities to those who have money to pay. Any accountability to universal life necessities is ruled out a-priori from the US Constitution, ruling market doctrine, and received theories. As I have commented in articles prior to his presidency, �Trump is America come to meet itself�. But the US cover story has not yet been decoded in its master functions of legitimation and idealization. What makes the eco-genocidal system acceptable to human consciousness is an ultimate story line and moral syntax that transforms it into heroic liberty, individualism and moral supremacy. This moral syntax has been imprinted into US empire since its original revolution against Britain to invade the America West to the Pacific Ocean to appropriate and destroy all the life and life support systems of the developed first peoples there as �freedom�, �development� and �self-defense�. What is required for the grand narrative�s success is to hide the reality of continuous eco-genocide by continuous false representations as the virtue and truth others fail to understand. This first principle the justifying morality tale entails the second � that an alien Enemy must always be blamed for the system�s destructive attacks on barriers and resistance to it. Conversion of all life and life support systems to limitless self-maximization of the US system and its richest citizens then proceeds under cover of fake news with wars of acquisition and control represented as courageous and beneficent for all.